‘Once upon a rock-and-roll time’… the Bear family played in band. However, they didn’t have very many fans yet. 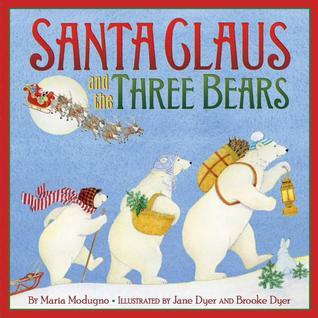 Papa Bear decided that what they needed was a soprano who could sing all the high notes. And it just so happened that as soon as they left their house in search of a soprano, a little girl came to their house. Inside, the little girl hurried over to their practice stage and began preforming a do-whop dum-diddy-do until she fell and broke the microphone. Then she tried Papa Bear’s drum set, Mama Bear’s guitar, and Baby Bear’s keyboard. She played and played until she fell asleep on the stage. When the bears came home from an unsuccessful day of listening to tryouts, they found the mess and the little girl drooling on the keyboard. Papa Bear disrupted her sleep and she awoke with a scream, which just so happened to be a perfect high C. Instead of running away, the girl stayed with the bears and together they wrote a new hit single – ‘Too Hot, Too Cold, or Just Right?’ They topped all the rock charts and their new fans were crazy about… Goldi Rocks and the Great Three Bear Band! Corey Rosen Schwartz and Beth Coulton have come up with a modern twist to a favorite old fairy tale. Written in rhyme and set with a rock and roll background, this story delivers a punch! Nate Wragg brings the timeless characters to life. The illustrations are both nostalgic and edgy. I love this new take on an old favorite! The traditional theme of breaking-in and destroying the bear’s belongings is freshened up with the final working together of Goldilocks and the Bears. The story is music to my ears! 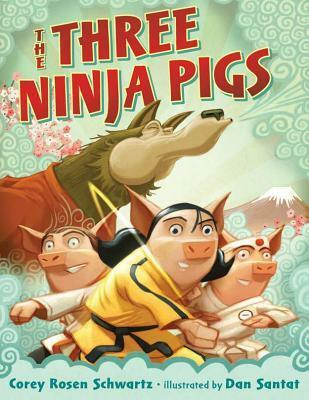 Corey Rosen Schwartz weaves the story with fast-paced action and humor and lots of ‘ninja’ terms to entertain the youngest ninja readers. She says she got her idea for the story when her own son told someone that he spoke a little ‘karate’. For anyone not familiar with the vocabulary used in the book, there is a glossary of terms at the end. Dan Santat, creator of Disney’s ‘The Replacements’ and holder of a black belt himself, filled the pages of this book with funny and authentic illustrations. I love reading fractured fairy tales and this is one of my new favorites. The rhyme and illustrations are ninja-perfect! And I’m also particularly pleased with the characterization of the third little pig being a smart, funny, and strong sister. Go Girl Power! Today is the First Day of Spring! And Susanna Leonard Hill is having a spring writing contest on her site, details below. Basically, The March Madness Writing Contest is a challenge to write a fractured fairy tale in 400 words or less. Having a spring theme is optional, and I decided to give it a try since today is the official first day of spring… at least on the calendar! My story is based on an old favorite, Jack and the Beanstalk. Now, before you get all outraged at using a familiar folk tale, remember that fairy tale is the umbrella for fables, folk tales, myths, and legends. Besides, on her own website, Susanna uses a picture of The Three Little Pigs, and her sample story (which is great, by the way) is based on The Gingerbread Boy, both folk tales under the fairy tale umbrella. So without further ado, I present to you a 400 word fractured fairy tale…. Jackie’s mother sent her to buy milk, eggs, and bread for the umpteenth polar vortex of the year. Obviously, she was preparing French toast for breakfast. Along the snow-covered path to the market, Jackie met a kindly old man; I think his name was Winter. He offered to sell Jackie three magic beans, which he assured her, would trumpet the arrival of spring. Removing her gloves, Jackie traded the man the coins her mother had given her for his mysterious magic beans. Upon hearing her freezing child’s tale, Jackie’s mother raged. “How could you fall for that old geezer’s trick?” She opened the door, letting in another cold blast of artic air, and flung the beans into the snow. Well, you know where this is going, right? 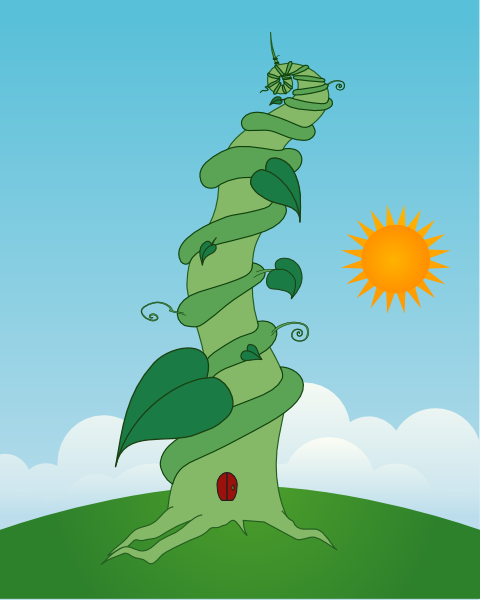 Overnight, a giant beanstalk grew outside Jackie’s door. In the morning she saw that it reached up, up, up, over fresh-fallen snow, above frosted trees, and past crystal clouds. Jackie donned her gay apparel, which wasn’t a gay as it had been three months earlier, and climbed the sturdy beanstalk. Jackie, tired and extremely hungry from her long ascent, accepted. She filled her belly with the most delicious French toast she had ever eaten and then immediately laid down for a quick morning nap. She dreamt of lush green lawns, fragrant flowers, and warm sunshine on her face. Waking up, she noticed that she was in a greenhouse. Why she didn’t realize that earlier, we’ll never understand. Regardless, Jackie tracked down the elf and pleaded her case. Joyfully he explained that this was Mother Nature’s greenhouse. He sprinkled a little magical soil over her and sent her home. As Jackie descended, she could feel the sunshine on her back and a warm breeze in her hair. She noticed the buds on the trees and the robin’s return. She jumped into a puddle and ran into the house. “Spring has sprung!” she proclaimed.